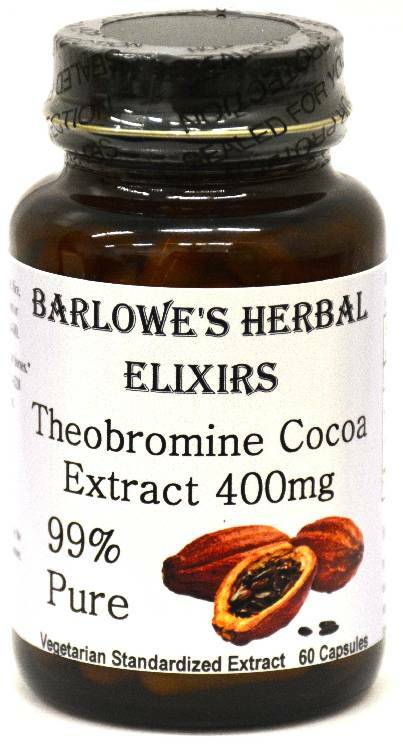 Barlowe's Herbal Elixirs now offers 99% Theobromine. Theobromine is a bitter alkaloid of the cacao plant and is the "feel good" ingredient in chocolate. It is also found in a number of chocolate-free foods such as tea, kola nut, and acai berries. Bottled in Glass! No Stearates! No Fillers! No Junk! Barlowe's Herbal Elixirs now offers 99% Theobromine. 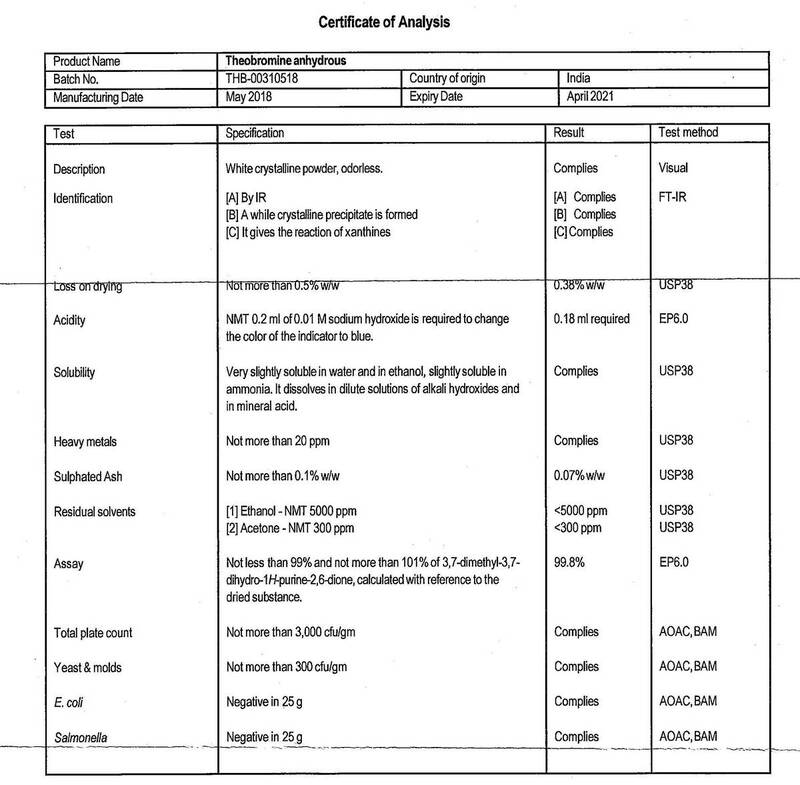 The Theobromine Certificate of Analysis (COA) for this particular batch is shown above. Theobromine is a bitter alkaloid of the cacao plant and is the "feel good" ingredient in chocolate. It is also found in a number of chocolate-free foods such as tea, kola nut, and acai berries. Despite its name, it contains no bromine. "Theobromine" is derived from "Theobroma", the name of the genus of the cacao tree (which is itself made up of the Greek words "theo" (god) and "brosi" (food), meaning "food of the gods"). Bottled in Glass! No Stearates! No Fillers! No Junk! Theobromine can be utilized for several beneficial effects. It has been identified as one of the compounds contributing to chocolate's reputed role as an aphrodisiac. 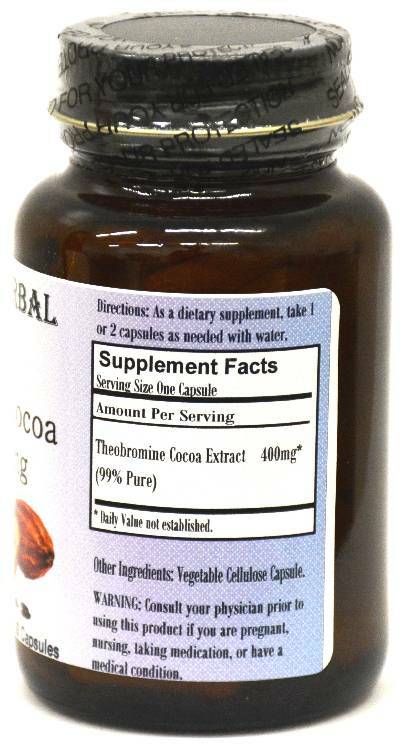 In modern medicine, Theobromine is utilized as a vasodilator (for increased blood flow) and a diuretic. The stimulant qualities of Theobromine make it useful in weight loss programs. Caution: This herbal extract is generally safe, but it is potent and should be utilized with care. This product is for dietary use. If unexpected side-effects occur, discontinue use immediately! Cocoa and chocolate products may be toxic or lethal to dogs and other domestic animals such as horses, because these animals metabolize theobromine much more slowly than humans. Do not feed this product to dogs or horses! Theobromine is also high in purine (uric acid) and if taken regularly, it is possible that it can contribute to the onset of gout in those prone to this illness. The above statements have not been evaluated by the Food and Drug Administration (FDA). This product is not intended to diagnose, treat, cure, or prevent any disease. Directions For Use: Take a capsule one to three times a day without food. Results and usage amounts may vary based on body type and weight.